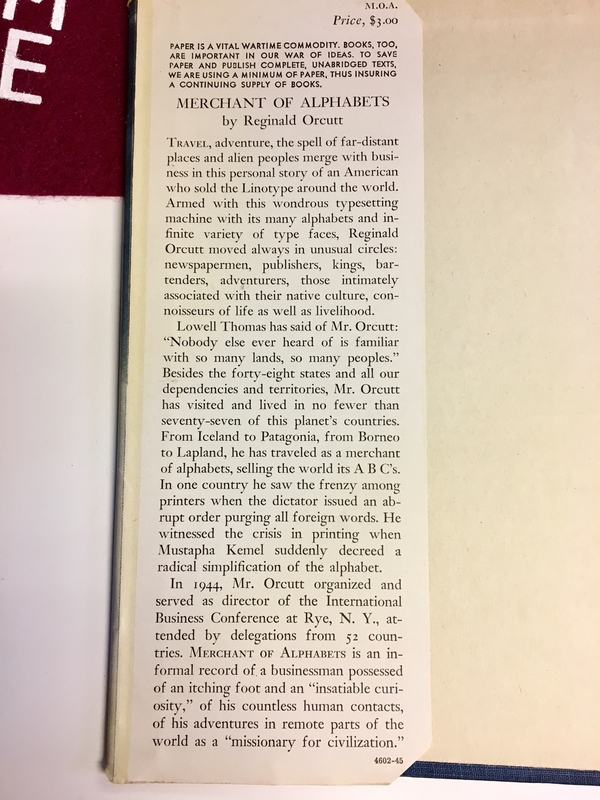 A few years ago (due to my research for "Linotype: The Film) I came across the book "Merchant of Alphabets" by Reginald Orcutt. 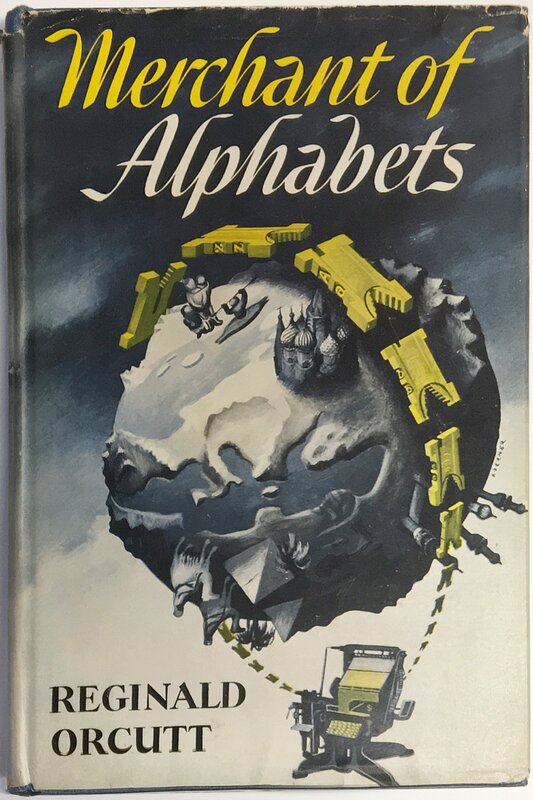 It is a fascinating book published in 1945 about Orcutt's work and travels selling Linotypes around the world. As you can read in the attached image, he visited at least 77 countries in the first half of the 20th century and tells great stories of travel, adventure, and includes a bit of typographic history. I am personally fascinated by his description of travel in the days of steamships, clippers, and telegrams. The book is an auto-biography written in the charming, old-timey style of a travelogue. Orcutt comes across as an ambassador of Mergenthaler Linotype in the classiest of sense of the term. Anyway, I'm considering trying to publish the whole book online, just for fun and to share with others. 1 - Is anyone interested in this subject or book? 2 - Would you read a chapter per week as some sort of series of posts? 3 - Where should I publish something like this? Medium? Personal blog (which I don't have)? 4 - Any idea of issues with copyright? The book was published in 1945 by Doubleday, Doran and Company (which has now merged with Knopf). It is not on Google Books as far as I can tell. Please be honest either way -- I'm not going to get offended if no one is interested. Maybe it is dumb idea, who knows? For question #4, this page about Can a book go online might be helpful. It's a cool premise for an autobiography. I'd definitely check out the first chapter, then continue if the pace, writing style and voice kept my interest. P.S. — Loved "Linotype: The Film"! It's indeed a great book! It even had a section on Armenia. Orcutt died June 11, 1965. Was he the copyright holder? Was it published in NYC (and hence in the USA)? If it was first published in the USA, and the copyright was never renewed, it is in the public domain. If it was first published in the USA, and the copyright was renewed, it is currently set to expire in 2040—if US copyrights are not extended before that time. For an obscure backlist book they let go out of print for good... if I had to bet one way or the other, I'd bet on non-renewal. Speaking as a writer who's dealt with more than one major US publisher, I would not bet the farm on their consistency or attention to detail. Or on their giving a toss about books that aren't big earners. Reginald Orcutt did not come to this subject out of the blue. His father was William Dana Orcutt (1870-1953), a prominent Boston book designer and head of a large book printing firm, the Plimpton Press. The elder Orcutt was the designer of the typeface "Humanistic" and author of In Quest of the Perfect Book, Reminiscence and Reflections of a Bookman, as well a novel or two and some others. Orcutt was a friend of Daniel Berkeley Updike and Bruce Rogers, with whom he founded Boston's Society of Printers, in 1905 (and still going strong). There may be a couple of Society of Printers members who knew Reginald Orcutt. I will check and let you know! You can find more about Reginald Orcutt's activities in this book: Paradigms Lost: The Life and Deaths of the Printed Word by William J. Sonn, though it appears that, by and large, it reiterates much from Merchant of Alphabets. An entire set of galleys is available on Google Books. This is great background information -- thanks! Any tips on approaching a big company like Knopf to find out if it was renewed or not? Most large publishers have a specific department to deal with copyrights and permissions. Don’t know what kind of response you’ll get about an older book like this, but it seems like the place to start. Simon is quite correct. I have had experience with major publishing houses demanding rights payments on expired works. They will try to get whatever they can, even if they have no legal right to do so. I recommend that you get in touch with a private agency, such as the Copyright Clearance Center (www.copyright.com); they may charge a little bit for an opinion, but their word is reliable and held in high regard. OT: don't believe that claim on the page Doug links to about Hitler having 'switched his thinking about letters' in order to 'promote Nazi science to the world'. Must have slipped past the editors. I've always been curious about this switch from Fraktur to Sans by Hitler. Do you know of any resources with more (and accurate) information? "Blackletter: Type and National Identity" by Shaw & Bain. Hans Peter Willberg's essay in Bain and Shaw's Blackletter is a decent summary, but the details are available in other sources too. the shift in 1941 represented, not Hitler changing his mind about fraktur, or any nonsense about the desire to spread 'Nazi science' abroad, but the realities of communicating to populations in occupied territories where blackletter scripts had been out of any but display/ornamental uses for hundreds of years. There are some details about Germany's sans/fraktur switcheroo in Paul Renner: The Art of Typography by Christopher Burke. "We don't seem to hold any rights to this title, but it was published by Jarrold Publishing (UK) after us, you should try them." So, I've sent off another email to see if Jarrold has anything on it. Oh man, I LOVE these "What They Think" videos from Frank Romano.